5 days into the New Year and part of my resolution this year is to post regularly (at least once a week) to keep up with whatever I’m working on. To catch up first of all, I made a couple of bags as Christmas gifts and then decided I’d like to change the pattern a little as I made the first for 2014. So here they are. 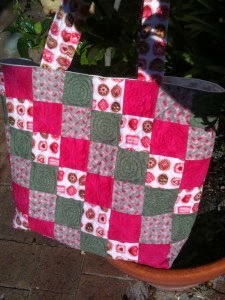 I used a pattern from Patchwork & Stitching Vol. 4 No. 4 from 2004 designed by Ruth Jennings. It’s a good one and easily made up in a short time (for me usually a couple of days, but I don’t sit at it from start to finish). Then I went on to quilt a flimsy I’d completed during 2013 – (there’ll be a few of those, which I guess are U.F.O.s but now become Works in Progress W.I.Ps, which sounds more productive). I used up some scraps from child friendly fabric I’ve used in a number of quilts to date and adapted a pattern I’ve seen in a number of places, to suit the size I wanted. It’s 46″ x 351/2″ with the small squares being 3″finished. The free-motion quilting I did I feel like I’m improving. 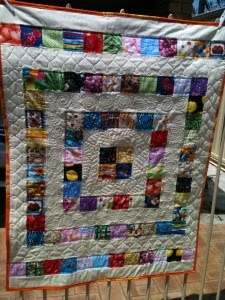 I started last year and this is around quilt number 10 with trying feathers, now swirls and other patterns. I really enjoy it on my fairly basic Janome 1600P QC. I bought it second hand and it’s semi-industrial, which comes in really handy with the walking foot taking any variations in thickness in it’s stride. 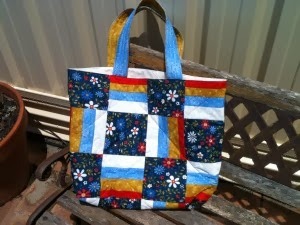 I’d like to give names to quilts, but I’m not sure how to go about it. I don’t think I could give them actual names, like people, but in trying to think of a ‘title’ for this one, the only thing I’ve come up with so far is fruit & cream. 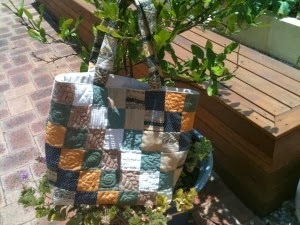 Bit boring as the fabric in between the squares is cream and there are a number of lemons, apricots etc in the squares. How do others name their quilts? Does inspiration strike somehow? Well, that’s all for now, so back to working on my next piece/s which are mostly cot sized quilts at present since I know a number of relatives and friends who are expecting happy bundles in 2014. For naming quilts, I usually do a mish mash of the name of the fabrics (either the colour or style, or if I use a collection then the collection's name) along with the name of the pattern. Eg. A recent quilt I made was a "scrappy Trip Around the World" and I used fabrics with stars and planets (Constellations) which made me think of being in space and when you're in space you "orbit" the world, so 'Orbit Around the World'.